Color amateur footage of activities at Heart Mountain concentration camp, Wyoming filmed by Reverend Stanley T. Evans who visited Rev. Donald Toriumi at Heart Mountain in 1945. Composed of home movie clips of the environment the Japanese Americans lived in during World War II in forced exclusion, including exterior views of the Community Christian Church Sunday School, Court house, Fire department, United States Postal Service, Hospital, barracks, guard house, trucks and tractors, and the U.S. flag. 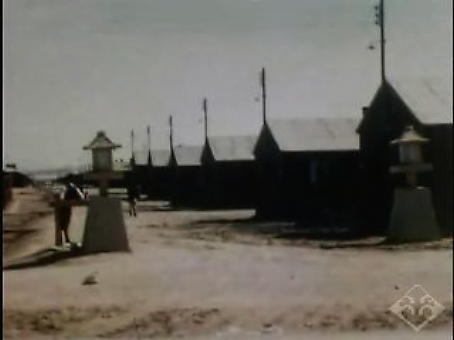 There is also footage of men in uniform, soldiers drilling, children reading books and people leaving barracks (6:58). Credits: Lloyd Evans Collection, Gift of Reverend Stanley T. Evans, Japanese American National Museum (95.73.1). Preserved and made accessible in part by a grant from the National Film Preservation Foundation. HNRC — Última actualización Sep 09 2014 4:37 p.m.